These 105' twin screw harbor tugs are based on the tugs Point Fermin and San Vincente that are operated by the Wilimington Transportation Company (Now a part of Foss Maritime) in the Long Beach and San Pedro Harbors. Our small 1/8' to the foot hull is ideal for the modeler who likes to use miniaturized components and run a tug that can easily fit into a case for travel. Of course, it is the perfect size to assist 1/96 scale ships into port as well! Our hull has the shaft, struts and triple rudder locations molded in, and come with a set of plans.Note: This is not a complete kit, and the decks, superstructure, propulsion shafting and other fittings will have to be built or obtained by the modeler. The Carol Moran operated in the New York area from teh 1940's until destroyed by fire in the late 1980's by the famous Moran Towing and Transportation Company. During that time, she moved everything from garbage scows to Ocean Liners. Our 1/4" to the foot model is large enough to do some serious pushing of her own when fitted with an appropriate motor, and yet small enough to carry easily and fit in a car. This is the perfect model when you just want to get in a pleasant day of Sunday boating without a lot of drama. The hull features molded side rail and bulwarks. Click to expand - Our Edmund J. Moran semi-kit built by Kurt Greiner to a freelance design. The large ocean going tug Edmund J. Moran was built in 1940 to move barge traffic along the Eastern seaboard as well as perform deep sea salvage and rescue work, with the coming of war in the Atlantic. This tug was destined to be very busy for it's first five years of life. The work of the Edmund J. Moran was considered so important she was given one of the first precious surface search radar sets to make it easier to find ships in distress. The E.J. Moran also has the distinction of being the only commercial tug to sink a U-Boat by ramming. The Intent was a typical example of the hundreds of diesel-electric harbor tugs built during the early 1040's to meet America's growing demand for tugboats. They were originally of steel construction, but when World War II started many were built out of wood to conserve materials needed for the war effort. Although the wooden tugs did not last long, they performed their duty, and the some of the steel hulled units are still in service today. Our little steam tug is representative of the type that were the mainstay of tug fleets on both coasts of the United States from the turn of the century until World War II. Following the war, many were retired, but a few are still in existence as museum pieces, and some still operate on an excursion basis. 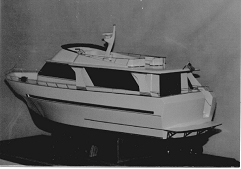 This little hull comes with a set of plans for these tugs as they appeared during the 1920's and 1930's.Note: This is not a complete kit, and the decks, superstructure, propulsion shafting and other fittings will have to be built or obtained by the modeler. These icebreaking tugs are used in many of the harbors around the Baltic Sea and Scandinavia, and were designed and built in Russian, with many variations for export. 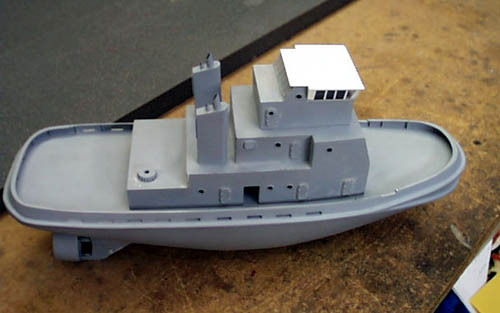 Many modelers use this hull as a basis for freelance designs or to model similar modern tugs. Our hull features molded in side rubbing rails, and comes with a set of plans. Special Shipping: This hull can be shipped via FEDEX Ground Service as an OS-1 size package. Minimum Shipping and handling in the USA 48 states is $ 80.00. These boats were built in Southern California in large numbers and are very popular even after 20 years of production. More commonly known as a 'Downeaster' , these are a very successful design with their ketch rig and a single shaft that exits through the keel for good cruising. Our hull for this sailboat features the bowsprit support imitation planking and raised aft deck just as it appeared on the original boat. NOTE: this is a hull only. 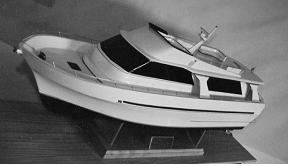 This hull is patterned after the 36' 'Choi-Lee' luxury sailboats that are produced in Korea and imported to the US as deck cargo aboard cargo ships, these boats come available in a variety of styles and rigs, all based on a common hull design which leaves the modeler with a wide selection of how they would like to complete a model on this fiberglass hull which features the large skeg and rudder skeg molded in. This is a hull only molded in white only. This hull is made from plans for the Mexican Lines Container Ship  Cerita. The hull master was built for us by her then serving chief engineer. This hull features a flush deck midship area with a raised quarterdeck and focsle area. Below the waterline she features the large bulbous bow and faired single shaft exit. A set of arrangement plans come with this hull. With todays huge container ships this would be considered a moderate sized ship which makes for a rather handy sized model for R/C operations. A couple of these hulls have been modified into US Navy Oilers.